I've seen this tag on lots of blogs, most recently on Blue Bow. 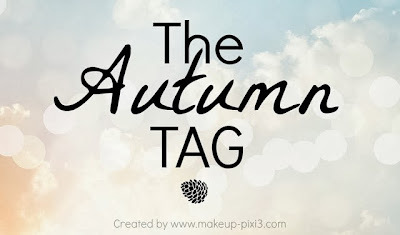 I love all things Autumn so I thought I'd give this tag a go! The only thing I dislike about Autumn is that I'm always ill when it comes around. This year is no exception (I'm currently in my Hello Kitty onesie as I write this). 1. Favourite thing about Autumn? My favourite thing about Autumn is definitely the cosy evenings spent indoors with PJs on, and a good book or film. I love the crisp mornings where I can layer up with jumpers. I've loved how hot this Summer has been but I've been looking forward to Autumn for the jumpers, hot chocolate, boots and scarves. Last year I would have said hot chocolate but now it just makes me feel really heavy. I do, however, like the Galaxy ready made hot chocolate that you put in the microwave with marshmallows on top. It's absolutely delicious! For Autumn and Winter I usually like vanilla scents. I don't buy candles much but I always turn to vanilla or lavender scents because they are quite calming. I use my candles as earring holders because I rarely use them. I'm going to be difficult and say that I avoid lipstick during cold weather - my lips are really chapped and I haven't found an effective lip balm so please recommend some good ones if you know any! At the moment I'm using cocoa butter for my legs but I think I'm getting really bored of the smell. At first I loved smelling like a walking, talking chocolate bar but now the smell is getting a bit weird. I also use Vera Wang Lovestruck body lotion - it works really well as a moisturiser! On my face I use Nivea Light Moisturising Day Cream. It's not too heavy on my face and doesn't clog my pores. I'm very boring and I normally don't wear eye shadow in the day, except for nighttime where I wear eyeliner and browns/blacks. I used to be a lot more daring when I was younger and wore blues and purples. I wish I was that daring now! There's not a particular band/singer I listen to this time of year. Today I'm seeing Fleetwood Mac, which I'm so excited about! My favourite song is Dreams so I can imagine I'll get a bit emotional when that comes on. I'm also loving The 1975 at the moment, their album is on my wishlist! I purchased a jumper from Urban Outfitters last year with a dinosaur on - it looks like a Christmas jumper but is much cooler than that. I wear it with my black Topshop Moto jeans and boots from Internationale. Any sort of chocolate like Roses, Quality Street etc is an Autumn treat. I guess that's more Christmassy but my parents have already started stocking up for Christmas and it's hard not to sneakily eat a chocolate or two haha. I'm going to be quite cheesy and say my favourite place is with my boyfriend, eating a Chinese takeaway and watching a film or TV. I always like our date nights too, we go to the cinema followed by a meal at a restaurant. I won't be seeing him very much at the moment so spending time with him is always lovely.